With a budget of $700, you can typically expect to buy a gaming laptop with little more than a modest Nvidia GeForce GTX 1050 graphics chip. I say that because that’s exactly what the Acer Nitro 5—one of the better budget laptop picks on the market—includes for $749.99. 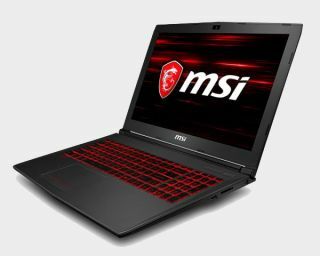 At the time of this writing, however, Walmart is selling the MSI GV62 with an Intel Core i5-8300, 8GB of RAM, 256GB of SSD storage and a higher powered GTX 1060 for $699. For that price, you're shelling out for not only the laptop itself, but for 2,000 V-Buck (in-game Fortnite currency valued at $20) as well. In addition, you get a rare Street Ops pack, a Street Ops skin, a pick axe, back bling and a glider in Fortnite, which amount to over $25 in savings. That said, even if you're not an ardent Fortnite player, the GV62 is normally $999 by itself. At least until this deal expires next Monday, December 17, you can buy it with a whole slew of virtual Fortnite merch for $300 off its shelf price. Not too shabby. So what's the catch? Well, although there is a true GTX 1060 inside the MSI GV62, it's limited to 3GB of video memory. It still performs a lot better than, say, a 1050, and it's a bit of an upgrade over a 1050 Ti. But the GTX 1060 also comes in a 6GB flavor whose benchmarks appear more flattering. The cheapest 6GB GTX 1060 laptop I've seen is the $799 Asus FX503 on Amazon, which costs $100 more than what's on offer here. For the price, you can't beat the $699 MSI GV62 from Walmart, especially when you factor in the helping of bundled Fortnite content.